Bimini was named one of the Top Ten Snorkel Destinations in the Caribbean by The Travel Channel. Bimini Undersea offers daily snorkeling excursions to favorite sites like The Bimini Road (aka Road to Atlantis), The Sapona, Turtle Rocks, etc. Our Snorkeling trips are done in shallow water (5-20 ft) and are great activities for the entire family. No prior snorkeling experience is required. Our friendly crew specializes in kids, families and first time snorkelers. 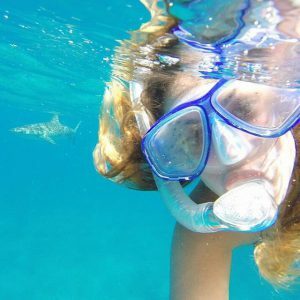 Ask for our special programs like The Sharks Adventure, where you will safely snorkel with Sharks for a once in a lifetime experience in a beautiful reef, south of Bimini. Listen to interesting facts about the Bahamian ecosystems, marine life, conservation efforts, culture and history. Join in our underwater tours. Interact with Marine Life and enjoy the unique reefs around Bimini.